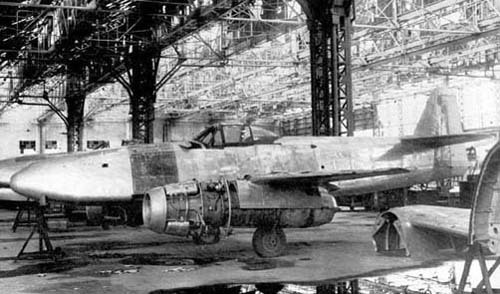 Japan's interest in jets increased in the month of September 1944, when the Japanese air Attache in Berlin sent a large number of detailed reports on the German Me262 program. Japanese Navy ordered Nakajima company to design a bomber similar but with more modest requirements (speed, load, etc. ..) as the Japanese industrial capacity was not prepared for it. 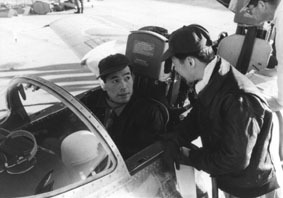 The Nakajima Kikka was designed by Kazuo Ohno and Kenichi Matsumura. 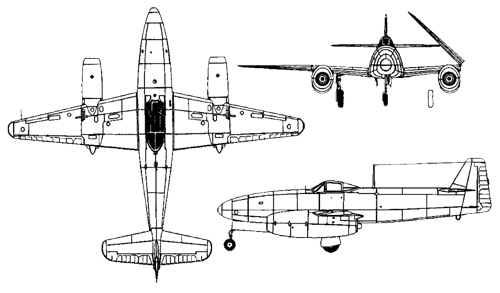 The Kikka first design studies envisaged the use of 440 lb. 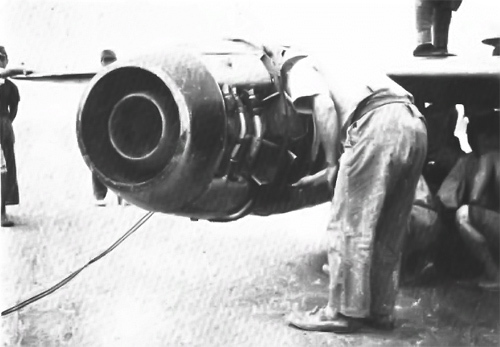 thrust TSU-11 units which were based on the Campini principles and employed the Hitachi Hatsukaze (Fresh wind) piston engine to drive a ducted fan compressor. 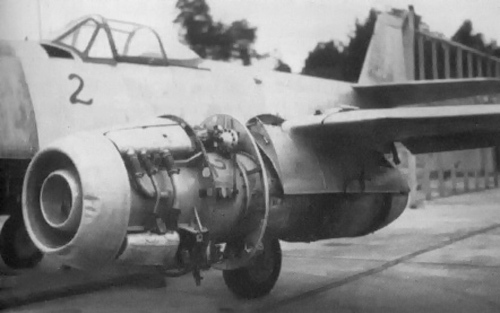 However, at an early design stage the Tsu-11 was dropped in favour of the Ne-10 (TR-10) centrifugal-flow turbojet, and the NE-12 (TR-12), which added a four-stage axial compressor to the front of the Ne-10. 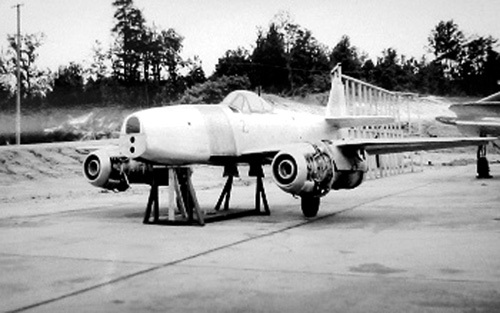 The first mock-up of the Kikka was inspected by Naval Officials on January 28, 1945, but estimated performance with the NE-12 turbo jet was uninspiring, and it was decided to make a further power plant change, supplanting the NE-12 with the more powerful NE-20. 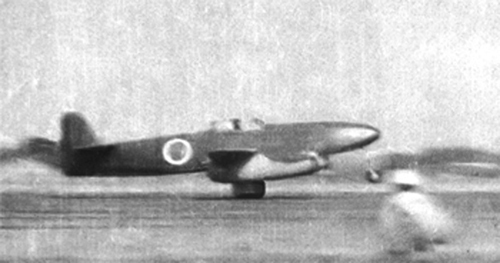 The prototype commenced ground tests at the Nakajima factory on 20th may 1945, and on 25th june the first Kikka was completed. The following month it was dismantled and delivered to Kisarazu Naval Air base where it was re-assembled and prepared for flight testing. Ground tests continued on this airfield until 13th July. On the 7th August 1945, Lieutenant Commander Susumu Takaoka made the first flight, with a duration of 11 minutes. His take-off run of 2,380 ft. took 25 seconds at an all-up weight of 6,945 lb. Wind speed was 23 ft.per second. He landed in 3,280 ft.
A ceremonial official "initial" test flight was made on 11th August, four days later. For this flight, rocket assisted take off (RATO) units were fitted to the aircraft. However, because their alignment had been miscalculated, The acceleration was so heavy that the nose of the aircraft came up, the tail went down and skidded along the runway. As a result the aircraft did not take off at all and was damaged when it ran off the end of the runway. Before it could be repaired Japan had surrendered and the war was over. Single-seat twin-jet attack bomber, of all-metal construction with fabric-covered tail surfaces. Two Ne-20 axial-flow turbojets, rated at 1,047-lb. of static thrust. Wingspan 32 ft. 9.11/16 in. Length 26 ft. 7.7/8 in. Height 9 ft. 8.5/32 in. Wing area 142.083 sq. ft.
Wing loading 54.3 lb./sq. ft.
Power loading 3.7 lb./lb. s. t.
maximum speed 433 mph at 32,810 ft.
On this Photo, you can see the RATO rockets used for lift-off. 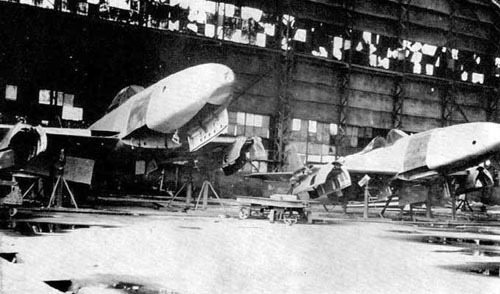 Unassembled Kikka in Nakajima's factory. 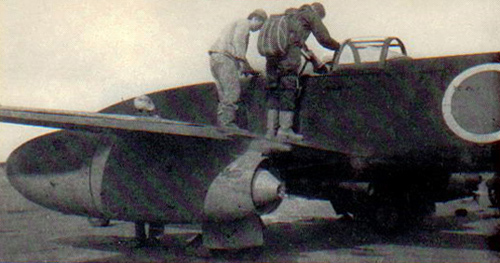 The second prototype was almost ready for its own first flight when the war ended on August 15. Between 18 and 25 more airframes were under construction. Some of these were two-seat trainers. The NASM's Kikka and an assortment of extra components are all that survive of this late war project. This aircraft was assembled from parts of the 25 pre-production Kikkas under construction at war's end. The aircraft's internal systems are incomplete, and the airframe shows no signs of the landing gear damage incurred when the test pilot aborted the second flight. The Museum also has two Ne-20 engines and these could be combined with the airframe during restoration to reconstruct an example of Japan's limited foray into jet aviation. 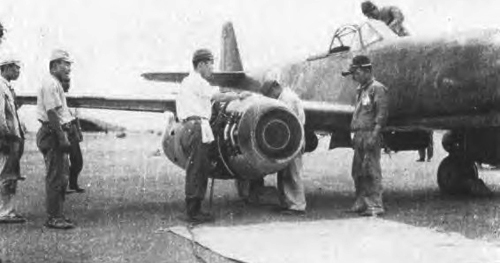 Susumu Takaoka was responsible for initial and development testing of several new aircraft for the Japanese Navy when he flew the Kikka for the first time on August 7, 1945. In the 50s, after the Japanese had regained a part of their freedom in aeronautics, he flew again as a test pilot. It was as Commander of the Experimental Air Unit when he realized the first flight of the Fuji T1F2 (January 17, 1958). 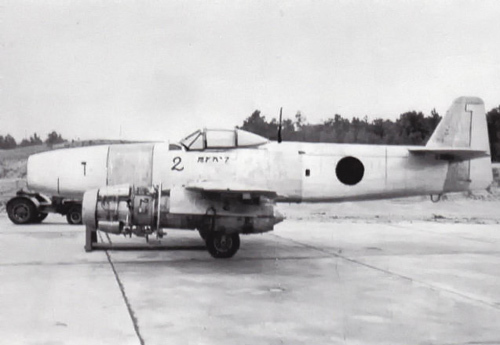 It was the first jet trainer designed entirely in Japan. He finished his career as General, having participated in many other programs, such as Mitsubishu MU-2.